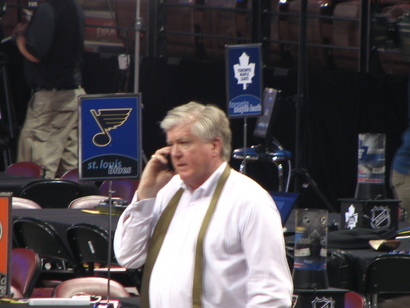 In case you live under a rock, Brian Burke is now on Twitter. This is a big step for the Maple Leafs GM as he becomes the third NHL GM to join the Twitterverse, and one of many in the Maple Leafs organization to start tweeting. Brian Burke started his Twitter career off by announcing his debut, and warning to dispel all fake accounts (we're looking at your DGB). 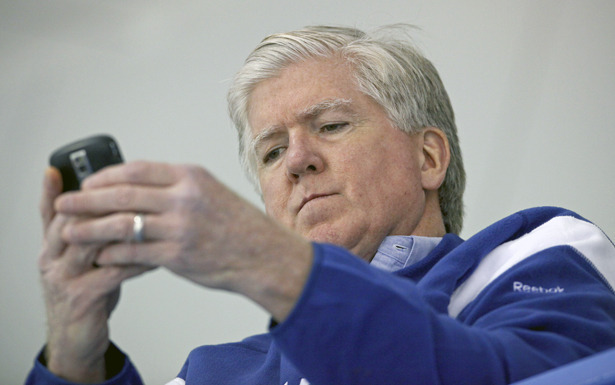 On a serious note, Burke plans to use his account to inform fans, hopefully entertain followers and provide clarity for the #Leafs when needed. If he keeps to his word, he has the potential to be a hilarious online presence. Don't get drunk and rip on Kevin Lowe. Wait... That would be hilarious, do that. Sometimes it's difficult to show seriousness within 140 characters. It might be a good idea if you created a hashtag for yourself such as #tieloosened to let us know you mean business. DON'T TWEET IN CAPS NO MATTER HOW MAD YOU ARE!!! Shakedown @GMScottHowson for Rick Nash with constant DMs and mentions. You might be shocked at just how often Tyler Bozak plays video games, don't be afraid to let him know he should be working on his finishing skill instead of his Call Of Duty winning kills. If you could get back to us on "who on earth is Steve Simmons?" that would be great. Players don't like being signed and then dropped right away, so don't follow people and then unfollow them. Join #TeamUnit. Instant Twitter cred. Make sure your password is secure. "Kessel", "Belligerence" and "Truculence" are not good passwords for you. i hope he tweets he had beans for supper.. I would love for him to fire Wilson over Twitter. That would be epic. I wish Burke would Tweet about what he really thinks. Would be nice to see him being the first guy to get fined by the NHL for tweeting something. I can see him being the first. I have been checking out your blog for the last couple of months and you guys have one of the best Hockey Blogs out there right now. I love reading your stuff at work. Keep up the great work. This strategy should include a report of where your Twitter account is today,https://twitter.com/darrenwinters01.. and where you want it to be in the nearest future.